Our dogs are our kids. We love and cherish them with all our hearts and their health and happiness is our priority, so I’m always looking out for healthy treats for them. For quite some time I’ve been purchasing beef jerky and ensuring it’s Australian made and in as natural state as possible. Each morning they would get a piece each for their breaky and they’d chew to their heart’s content. Then I started to find inconsistencies each time I purchased a new bag. Sometimes they were lean and easy to snap, other times they were covered in fat which I had to then scrape off, sometimes thick and tough. I’d been thinking about investing in a food dehydrator for over a year now, so recently I stopped procrastinating and ordered one online. It arrived and I’ve been working it hard ever since! I have made beef jerky a few times now for the #3dogkateers using topside which I freeze and then slice with a mandolin (very carefully). 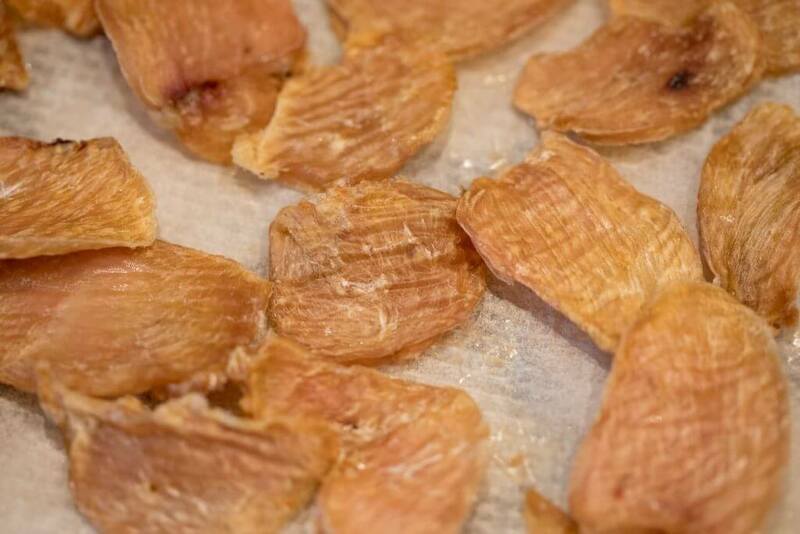 I am now also making chicken jerky once a week, from free-range chicken breast which I freeze overnight and then cut with the mandolin in the morning before it freezes rock hard. 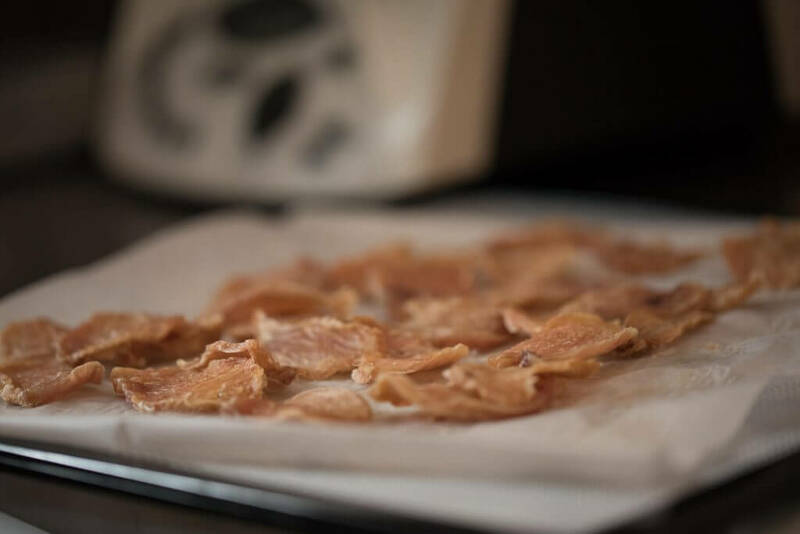 Once sliced, I remove any fat and then lay the slices out onto the trays of my dehydrator, which I line with baking paper. I set the dehydrator to about 75 degrees celsius for about 6 hours and the result is perfect chicken jerky with absolutely nothing added. 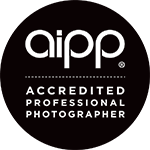 This is what I use for my client shoots too… I haven’t met a dog yet who doesn’t go wacko over it! 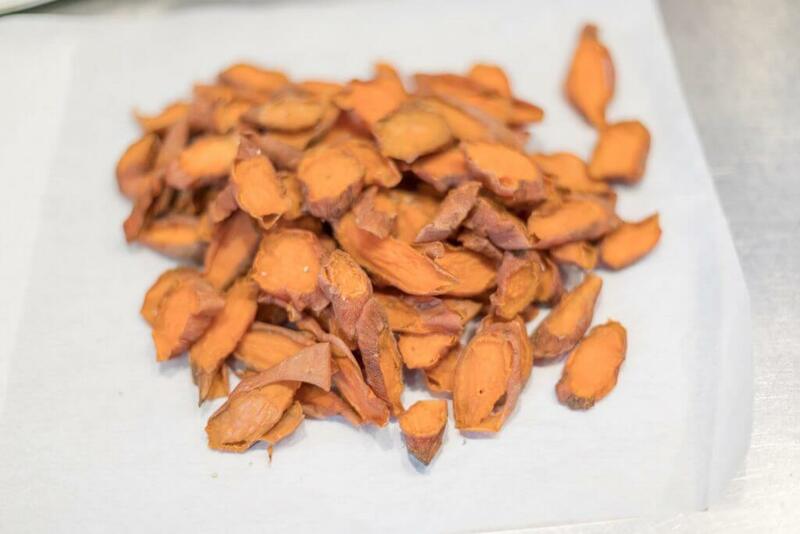 Just last week I purchased a bag of small sweet potatoes and made Sweet Potato Jerky… what a hit this is with ours, so much so, I went out again yesterday and bought 3 more bags. It’s hard to find the really petite sweet potatoes but they work well for this so if you’d like to make your own, keep an eye out for them. 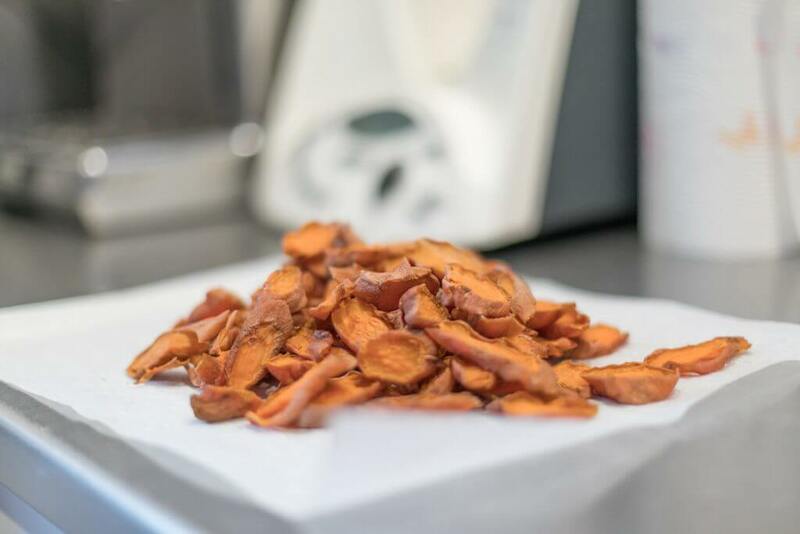 Firstly, I wash the sweet potato with fresh cold water and a vegetable scrubber, then place them in the steamer with a good amount of water in the bottom pan. Put the lid on and set the timer for 30 minutes depending on the amount you are steaming. This particular batch was huge and took about 30 minutes. You just need to steam them until you can put a fork through them firmly. Don’t overcook as they will become too soft to cut for the jerky. Once your sweet potatoes are just tender, take the lid off an allow them to cool down enough for handling. Next step is to cut them into 50mm rounds. I just use a sharp knife and place each sweet potato on a wooden chopping board. After slicing each one, I place the slices onto a dehydrator tray lined with baking paper. 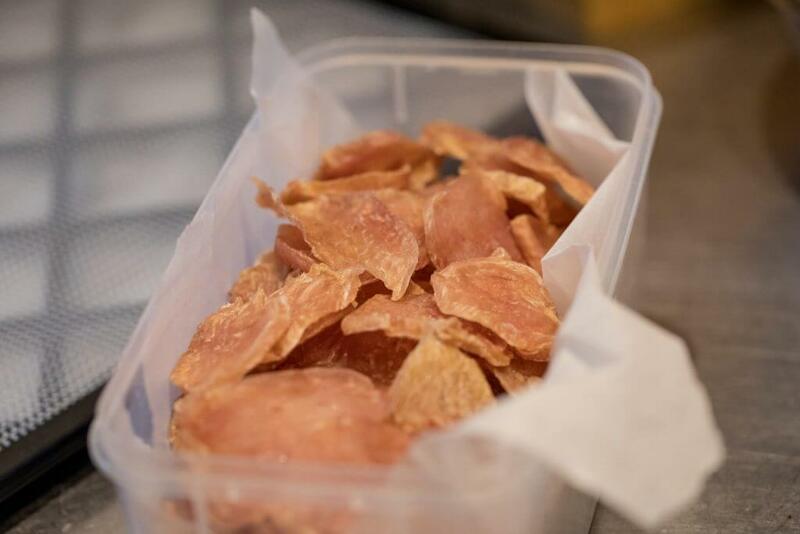 When all the sweet potatoes are sliced and in the dehydrator, I set it at around 52 degrees celsius and leave them for about 8-12 hours. When cooled down I place them into a paper lined storage container and keep in the fridge. Whilst doing this I have three little dogs at my feet begging for a slice… they absolutely love it! So there you have it, some quick insights as to how we keep our little dogs healthy and happy with the peace of mind of knowing exactly what they are eating. I carry a little zip-lock plastic bag with me on our walks each day with some of these treats and it still amazes me how excited they get when I yell out the word “treats”. They come rushing back to me no matter what they are doing and the smiles of joy are heartwarming. 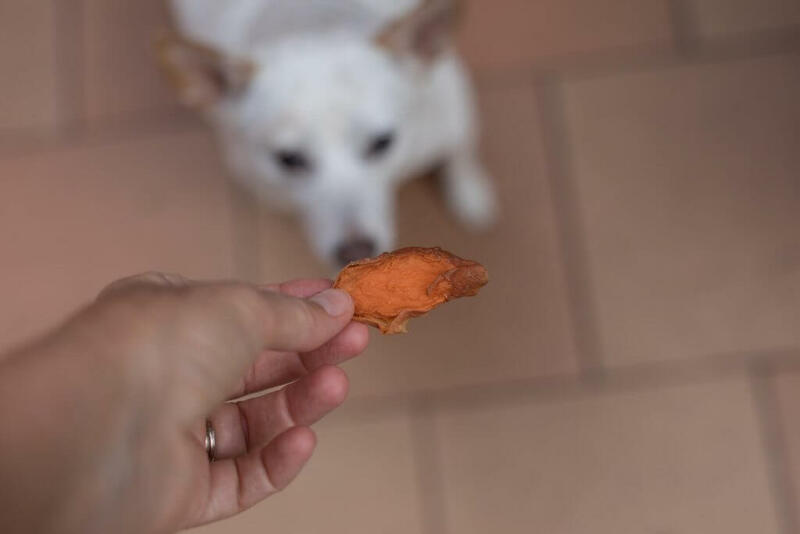 Here is Little Luna taste testing this latest batch of sweet potato jerky. 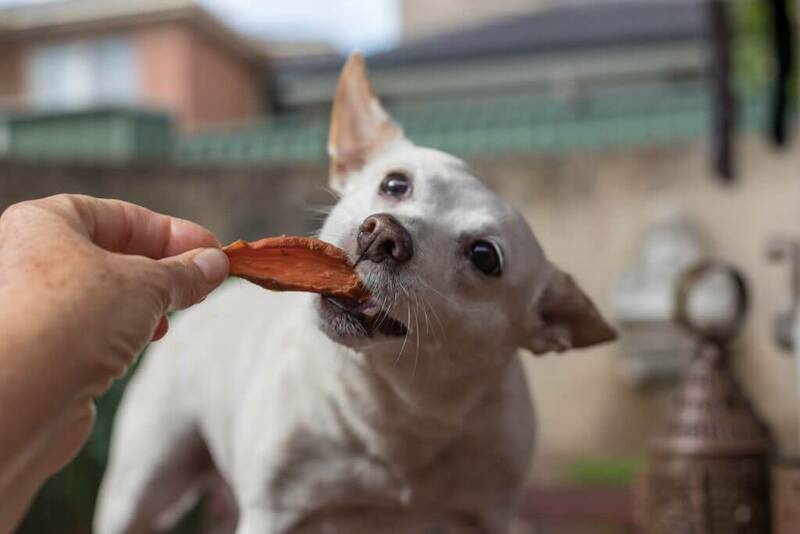 What is your dog’s favourite treat? Do you have any great recipes to share? I’d love to read them if you do, so please share them here in the comments, or post them on my Facebook page, and I will add them to my list of new recipes to try and maybe even feature your recipe in future blogs if they are a hit with the #3dogkateers. If you don’t make your own treats, please take care when purchasing treats for your precious dogs. Always read the pack to find out the country of origin and the ingredient listing. If I do purchase treats, they must be Australian-made. 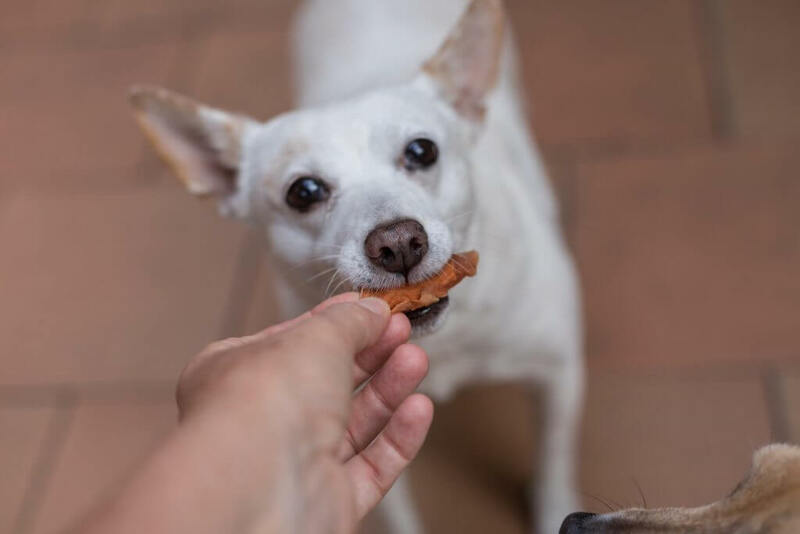 My go to brand for treats when I go to the animal shelter each week, or run out of my home-made treats, are the Savour Life Australian Chicken Training Treats. Apart from being an awesome product, they donate 50% of their profits back to animal rescue organisations to help rescue dogs. That’s the type of organisation close to my heart! Aside from my holistic treats, I feed my #3DogKateers ethical food by Frontier Pets, you can learn more here about this amazing choice. 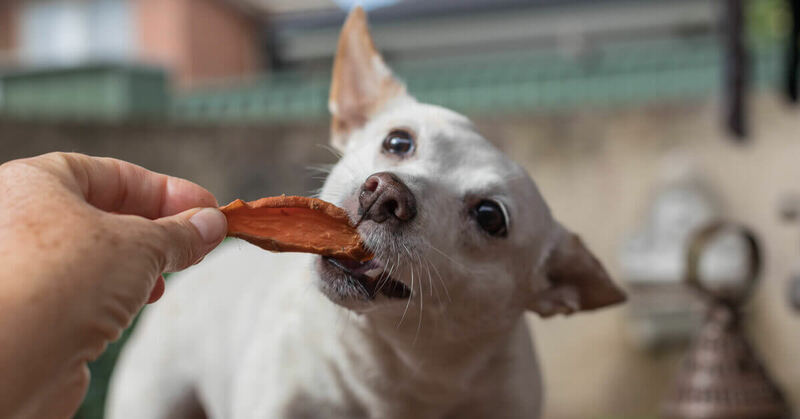 If you think your dog would love to try my home made chicken jerky, and you’d love some stunning portraits of your dog for your home, get in touch and we can chat about planning the perfect photoshoot.